In his Friday Sermon of 28 December 2012, the Khalifatullah Hadhrat Munir Ahmad Azim Sahib (atba) of Mauritius gave a profound discourse on the hidden pearls of wisdom underlying the Qur’anic teachings on keeping away from evil inclinations and Satanic tendencies. Belivers are those who do good deeds and prefer the welfare of others even over their own personal comforts. They keep away from selfish desires and other evil inclinations and constantly seek to deny giving any corners for Satan to cast his evil whisperings. “When you, the believers, leave behind the temporary attractions of this world and refuse to follow Satan in his path, and you give Allah preference over all things, it is then that the divine blessings are bestowed upon you; Allah sends down extraordinary blessings, and along with these you reap the good of your good deeds and you get a complete Iman (faith)”, exhorts the Messenger of Allah of our times. In this Quranic verse, Allah says that this Quran and the words therein contain such clear proofs for humanity, that is, when someone studies it with Taqwa (fear of Allah) and in whichever he wants, then he shall certainly see clear proofs (of the truth) in it. The Dead Sea Scrolls or the Qumran Manuscripts are an important source of historical information regarding the material and spiritual life in an early Community of Believers during the Biblical times. According to many scholars, the Scrolls offer illuminating insights on the beliefs and practices of the historical Essene Community of Jewish people to which, it is said, the Hadhrat Jesus (as) belonged. The majority of the Scrolls, preserved at the Israel Museum in Jerusalem, are now available online and can be accessed by all here. 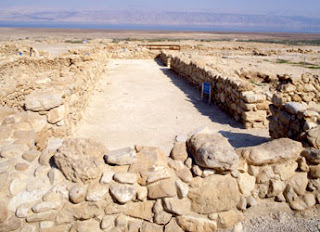 Dating from the third century BCE to the first century CE, the Dead Sea Scrolls were discovered between 1947 and 1956 in eleven caves on the northwestern shores of the Dead Sea, Palestine/Israel. The manuscripts are generally attributed to an isolated Jewish sect, referred to in the scrolls as "the Community," who settled in Qumran in the Judean desert. 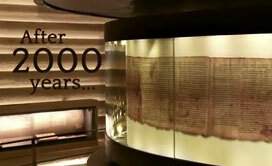 The Dead Sea Scrolls, which include the oldest known biblical manuscripts in existence, offer critical insight into Jewish society in the Land of Israel during the Second Temple Period, the time of the birth of Christianity and Rabbinic Judaism.